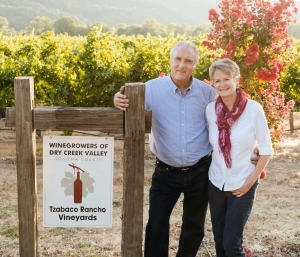 TZABACO RANCHO VINEYARDS is located in the heart of the Dry Creek Valley in Sonoma County and has been continuously farmed by family members since 1856. 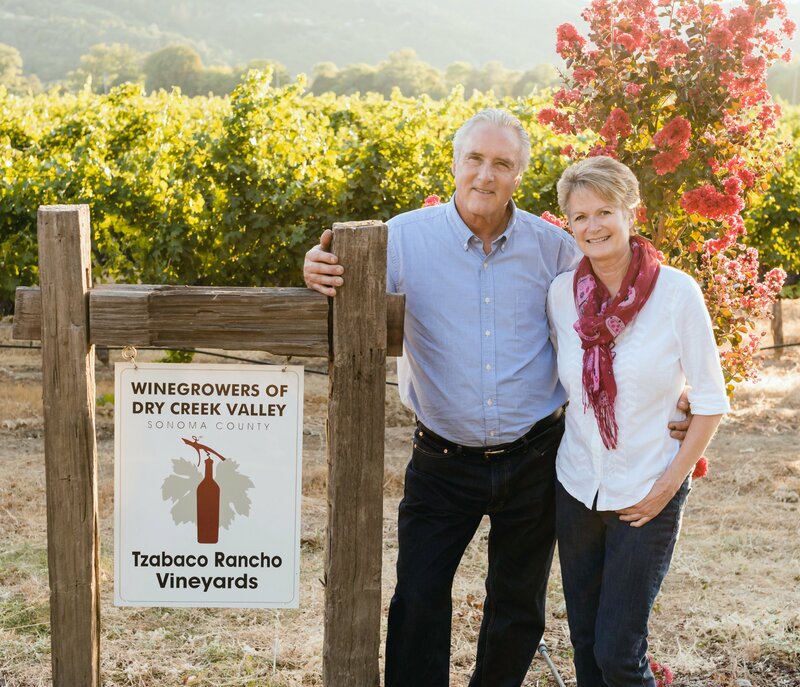 Brian, Janice and son Tom Schmidt share their vision of proudly producing premium wine grapes in beautiful Dry Creek Valley using sustainable winegrowing practices that will allow our family to continue farming for generations. The vineyard is planted to multiple white and red varietal winegrape clones that make wonderful, award winning single varietal or meritage white and red wines. We sell to a number of major wineries and an enthusiastic clientele of home winemakers. Whether you are a new to winemaking or a veteran winemaker, our grapes will provide a solid foundation for your wines. 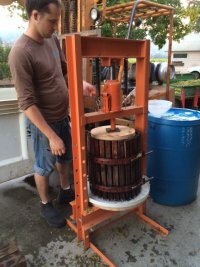 Enology advice is available from Janice Schmidt, a UC Davis trained winemaker, who worked for Jordan Vineyard and Winery for 20 years before retiring to help guide replanting in the vineyard. She takes pride in guiding home winemakers in the rewarding process of making wine while making award winning wine herself for the ESTATE 1856 brand. A VIDEO BY RODNEY STRONG VINEYARDS SHOWCASING THE VINEYARD! We are proud growers for Rodney Strong Vineyards and were so delighted when they asked if they could film Brian & I in the Spring of 2014 as representative growers from Dry Creek Valley. We spent a day with their filming crew focusing on the early Spring vineyard growth highlighted by the soft light in the morning and lingering light at sunset. We focused on our Vertical Shoot Position trellis system which allows the leaf canopy to be uniformly upright for maximum leaf photosynthetic activity and also talked about the importance of morning side leaf removal for great flavor development. It was fun and exciting to participate in the filming process with such a professional crew. We think that they captured this Spring moment exceedingly well and are very happy to share this with you! One of our winery clients, Spann Vineyards, has kindly provided our latest testimonial! “We bought Malbec and Petit Verdot grapes from Tzabaco Rancho Vineyards from 2008 through 2014 and were very happy with the quality of the fruit as well as with the farming skills of Janice and Brian Schmidt. Our 2011 Malbec from this vineyard was rated 92 points by the Wine Enthusiast and we have always considered the Petit Verdot we produced from this vineyard one of our best and favorite wines each year. Janice has always been very reliable in her brix and pH readings and in keeping us informed as to which rows are at varying degrees of ripeness. They have also been very good at picking on the harvest dates that we requested. We work hard providing great fruit to all our wineries and homewinemakers!! Harvest 2018 is on the horizon…so if you haven’t yet talked to us about the varietal you wish to purchase…do it now! We did start taking reservations earlier this year…so there are now some varietals that are completely sold out…but note that there are still exciting varietals to try! Please call 707-433-2511 if you have any questions about availability!! Our own wine brand ESTATE 1856 has released our FOURTH vintage of all GOLD medal wines! 2012 DUVALL’S PROSPECT Bordeaux Blend which won a PLATINUM MEDAL and 93 POINTS at the 2015 Critic’s Challenge International Wine Competition as well as a DOUBLE GOLD MEDAL at the 2014 Grand Tasting Awards and GOLD MEDALS at the 2015 San Francisco Chronicle Wine Competition and the 2015 Sunset International Wine Competition! Visit our other PLATINUM MEDAL, BEST OF CLASS AND GOLD MEDAL 2012 wines, including our 2012 Cabernet Sauvignon, our 2012 Petit Verdot and our 2012 Malbec at our winery website, Estate 1856!